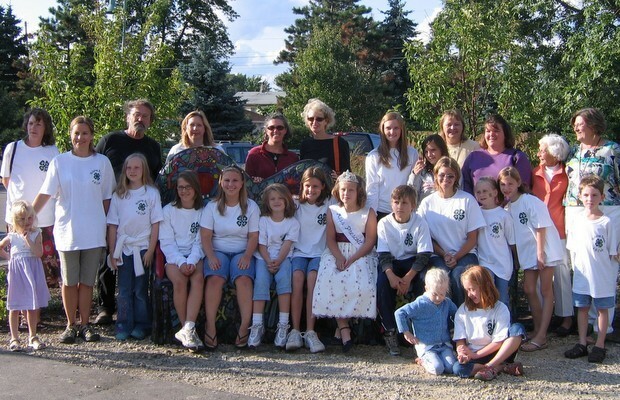 Sixty community members, including volunteers from Friends of Freedom Park, the Helping Hands 4-H club, and Prescott High School’s Ecology Club, created this bench with artist John Turula. From downtown Prescott: Hwy 1 mile south; look for Freedom Park signs. Turn south onto Monroe Street. Bench is in the butterfly garden. The 4-H motto is “Learning by Doing.” The young members of Prescott’s Helping Hands 4-H club did a lot of doing, and a lot of learning, while working alongside artist John Turula, Friends of Freedom Park volunteers, and the Prescott High School Ecology Club, on the Prescott Art Bench. They also changed the way Turula works. Their fresh eyes showed Turula new ways of looking at problems, like the relationship between shapes and colors. While Turula learned from the kids, and the kids learned from Turula about things like color and tile and design, their advisor Gail Stewart says just as important was learning about teamwork, and staying with something to completion. The bench is surrounded by the colorful flowers of a butterfly garden that was also part of the Bench Project. Master gardener Kathy Oss taught the team about native plants that the butterflies like. They were also visited by experts in bugs and other wildlife that makes the St. Croix Valley special. Located at the confluence of the St. Croix and the Mississippi, Stewart says kids came up with lots of symbols to represent the rivers, the local area, and the Midwest’s subtle beauty. There are cardinals, robins (Wisconsin’s state bird), oak leaves, maple leaves, caterpillars, and, on the back, a Bald eagle. Freedom Park is named after an eagle called Freedom that was released there on the cliffs after being injured and rehabilitated. It was important for the bench to beautifully reflect the region’s character, but Stewart says the group also believed it needed to be functional. Nestled in the butterfly garden, it was also specifically placed so adults could sit on it and watch their children play on the nearby playground. The challenge brought everyone together around the shared goal, which opened the door for some happy memories. 4-H advisor Stewart recalls an afternoon when the group visited Turula’s studio to make ceramic tiles, and they had time to wait while glaze dried. Everyone sat under a big tree in the yard and had a picnic. The only thing missing was a nice bench. 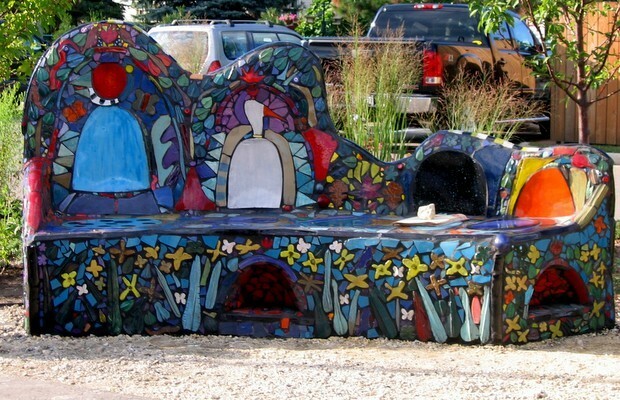 Look at the colorful handmade tiles on this bench to find images of the butterfly’s life cycle – egg, caterpillar, chrysalis, and butterfly. Do you see other pictures on this bench of things that butterflies need to survive? What can you do to help the butterflies? 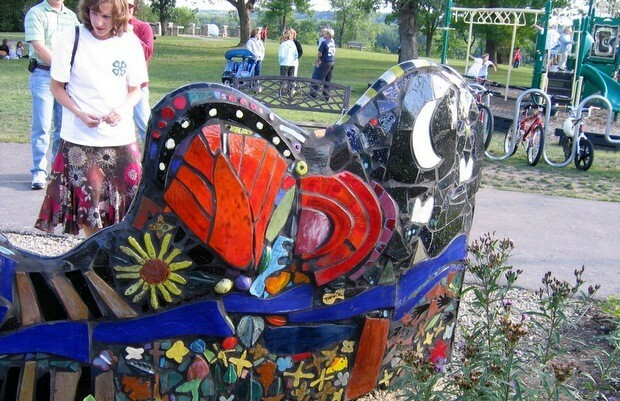 In 2008, more than 60 Prescott residents created the Butterfly Bench in collaboration with artist John Turula. Coordinated by The Phipps Center for the Arts and St. Croix Valley Foundation. Special thanks to 2008 Helping Hands 4H Club, Stewart and Westphal Families, Great River Road Visitor Center Volunteers. 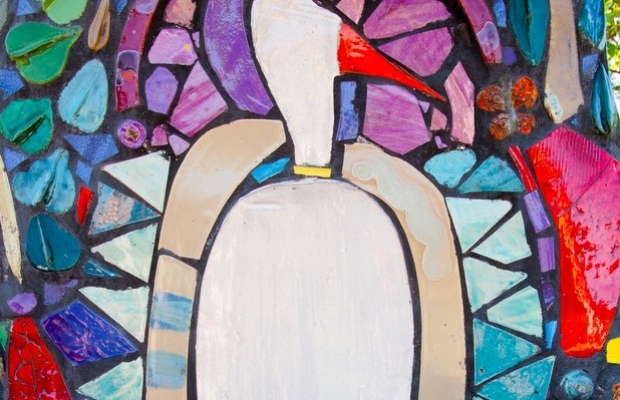 Donors: Harvey and Rose Anderson, in honor of Cay and Chuck Laney, The Phipps Center for the Arts, Prescott High School Ecology Club, St. Croix Valley Foundation, Wisconsin State Arts Board.